Louis Vuitton ahead of the curve, pictures from 2010. 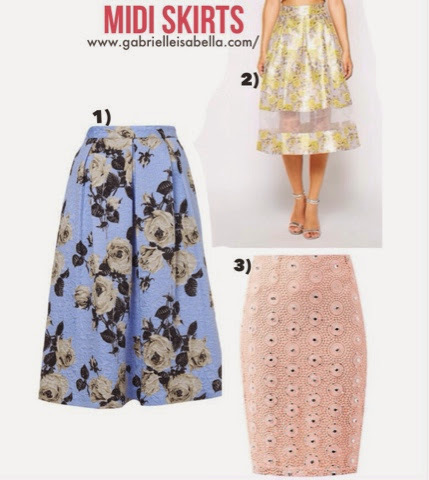 Hello again, this time I'm hear with another trend prediction for you all, which this time is midi skirts, which are coming back in with a bang, but mainly in an a line cut. I saw a few adventurous people beginning to wear midi skirts (again in an a line cut, which fashion remembers as its' last debut as the poodle skirt) around late Spring, by no means are they a new invention, but when the length is combined with an a line (which has been done now in the last couple of months) it is reminiscent of the 40s and 50s. I have to say, not one person I saw wearing it has reminded me of a 50s housewife, maybe because you need to be quite bold in fashion to wear it? Or be aware of the trend for now? Possibly. The length makes it a statement right away, so keep it came on the eyes and pair it with something like a casual top (even more so if it is made of a really heavy material, to make it more casual - think Cara Delevigne and how she wears loose tops with cigarette pants) or if the skirt is a made from a looser material, a cute crop will do. Aslo, to make it look more sophisticated, heels without a platform achieve that, but if you feel like the outfit you have is a little too aging, heels with a platform makes it that little bit more youthful and of course makes you legs look slimmer and taller. It's not just bloggers I've seen wearing the trend, young celebrities have been wearing a line midi skirts to. For evenings out and casual day time, such as Ariana Grande and Chloe Moretz. One last piece I have to say is, don't be afraid of it! If you get the one at the right length and a line it can be really flattering, saying that I have found it hard to find one, as I am quite short so the result is I look even shorter, but that doesn't mean I'll stop looking! I'll leave you with my favourite midis at the moment! Most are midi but if you feel more confident in the more modern pencil skirt type, I've got you sorted.